The idea of using the shadow of a stylus on the wall to measure the flow of time is so old that it dates back history and get lost in prehistory. Over the centuries techniques, purposes and also decorations of the sundials have been modified, and today they represent an important evidence of the story and costumes typical of different historical periods and geographical areas. Nowadays the use of this instrument seems to have been forgotten, given that many sundials are not serviced any more and it is rare to see new ones. Nevertheless sundial has a great charm and it has some modern characteristics: it does not consume energy, it does not need batteries, it does not pollute. Also the mottos inscribed on the sundials are very interesting: often they are in Latin or in the local language. One of the most common is “hora non numero nisi serenas”, while another one makes you thinking: “vulnerat omnes ultima necat”. Villa Castelbarco sundial is known as the French-type (the most common in which the hours are counted as today): the graph looks like an inverted fan and Midday is indicated with a vertical arrowed line. This kind of sundials were introduced in 1700 by Napoleonic laws in order to substitute the local methods and standardize the system. Villa Castelbarco sundial allows to read the hours from before 9 a.m. to beyond 3 p.m.; it is also possible to understand the seasons thanks to the cross line that is the equinoctial line. This line is moved by the sun just two days in a year, that are the Vernal Equinox (21 March) and the Autumnal Equinox (23 September). There is another line, the highest one, indicated on the right by a stylized Capricorn and that indicates the Winter Solstice (22 December) and on the left by a Cancer that indicates the Summer Solstice (21 June). 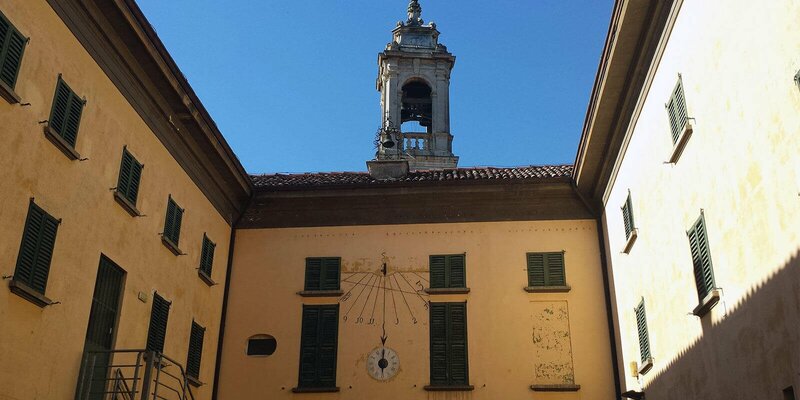 There are lots of things to say about Sundials in general and this one in particular, but the aim of these few lines is to invite those who has the chance to visit Villa Castelbarco to linger over the Sundial and let themselves fascinate by its lines both simple and rich of concepts.